This New Year, I Hope..
We have great hope in all our minds every New Year. 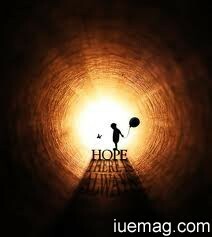 Hope is an unconditional belief of something good accompanied with an expectation of obtaining it. Often, life's frustrations leave a silence in our souls but hope waits to uplift the present and future. Yes, I too have a hope! Last year was a mixture of some good things and some not-so-good things. Happenings are not connected to time, but it is human to blame the year. My last year's frustration is the deadly disease CANCER. I had seen a close soul suffering from that killer disease. The feelings of the soul every second was nothing but hope to survive. The frustration I had was to save the soul. How irritating it is when medicine cannot help! I always admire the field of medicine, but now I am irritated, frustrated. But HOPE started to play a role. I understood - "Every situation that looks bad has an equal amount of good, if you look for it. Everything that happens just "is". Like two sides of a coin, it has a side that looks 'bad' and it has a side that looks 'good'. You get to choose. Whatever you call it, it becomes for you. So, in any situation you need to remind yourself that the universe is friendly to you, that there is a virtually infinite supply of everything you need, that there is always enough money, customers, time, love, friends, etc so that no situation can leave you without those things for long. And that you do not ab-solutely need 'that one', you can move on to the next. Next, you need to remind yourself that you get to decide what to call the situation - good or bad. You know the good is there (and, yes, I know, it is sometimes hard to see when you're in the thick of it), but you do know it's there. The hope in me is that many people with can-cer will be cured this year. How? I don't know, but I have a hope. Let's face it. Cancer is definitely scary. In fact, a cancer diagnosis is a very, very scary thing for anyone to face, even when it is a cancer that is treatable and potentially curable. One reason is that it is such a common type of disease, that by the time we reach a certain age, almost all of us have seen at least one friend or loved one die of it. And more often than not, that death is horrific, and even when it is not the wasting and weakness that are often seen before the end provokes a visceral reaction produced by few such diseases. It's great to hear that The Cure Cancer Foundation is supporting researchers who have developed medicines which have been shown to kill a wide range of tumors, both in the lab and in patients. These new generation medicines promise to be to Cancer what Penicillin was to deadly bacteria. The National Cancer Institute (NCI) has approved the further testing necessary to obtain FDA approval and thereby get the medicine to ALL the cancer patients who desperately need it. The doctors and hospitals are available and waiting, but without the medicine these crucial clinical trials will not take place. Cancer will continue to kill 1,500 people each day. Cancer has killed more of us than all the wars we have fought, and all the natural disasters we have suffered. My only hope is that people all over the world will join hands, to kill this killer disease.